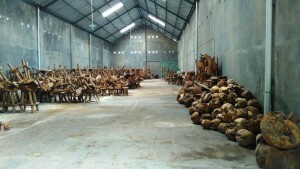 ONE OF OUR NEW TEAK ROOT FACTORIES. We have three factory/warehouse compounds with a combined 20,000 square meters (215,000 square feet) manufacturing and dispatch floor area. Plus 3 container loading bays. We are the world’s leader in producing products made from old teak tree roots. Each piece is unique. Our teak root products are finished to the highest standard. And you are buying direct from the factory at FACTORY PRICES. We are not agents or wholesalers pretending to be factories. WE ARE THE REAL DEAL.